The div tag is known as Division tag. The Div tag is used in HTML to make divisions of content in the web page like (text, images, header, footer, navigation bar etc). Div tag has both open(<) and closing (>) tag and it is mandatory to close the tag. The Div is the most usable tag in web development because it helps us to separate out data in the web page and we can create a particular section for particular data or function in the web pages. It is used to the group of various tags of HTML so that sections can be created and style can be Applied on them. As we know Div tag is block level tag in this example div tag contain entire width. It will be displayed div tag each time on a new line, not on the same line. questions? What did you expect and what did you get? well thought and well-explained solutions for selected questions. 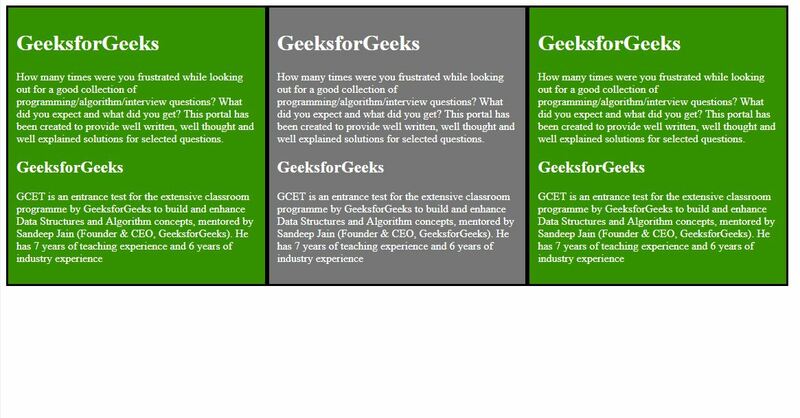 concepts, mentored by Sandeep Jain (Founder & CEO, GeeksforGeeks). 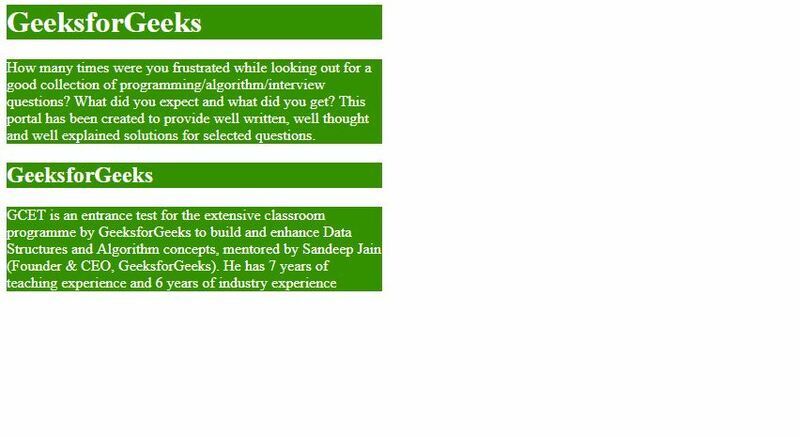 He has 7 years of teaching experience and 6 years of industry experience. Div tag is a container tag inside div tag we can put more than one HTML element and can group together and can apply CSS for them. Div tag is very flexible to creating web layouts and easy to modify. in below example will show grouping of HTML element using div tag and create block-wise web layout. Using Div tag we can cover gap between heading tag and paragraph tag in this example will display three blocks web layout. In case of internal CSS: we need to define Class in the <head> section of HTML within <style> element. In case of External CSS: we need to create a separate .css file and include it in HTML code in <head> section using <link> element. The class name should be different from other class name in other div otherwise the CSS used in one div can affect another division. 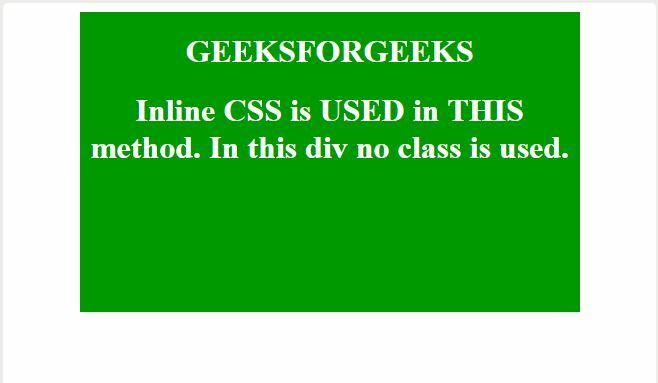 <h1>Inline CSS is not USED in THIS method. we can directly use CSS in div also this method does not require of CLASS. Div in HTML coding is used as a container tag also because it is the one that can contain all other tags. 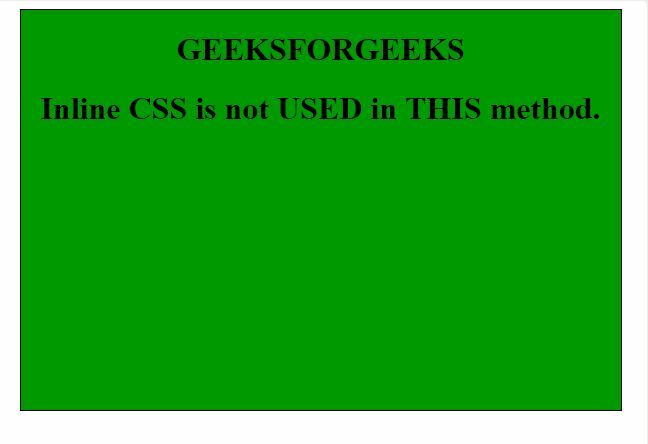 <h1>Inline CSS is USED in THIS method. In this div no class is used. In this method, we applying inline CSS in the div tag. By using style attribute this style will apply to that particular div. while div tag is a block level element and span is inline element The div tag creates a line break and by default creates a division between the text that comes after the tag as begun and until the tag ends with </div>. div tag creates separate boxes or containers for all elements inside this tag like text, images, paragraphs. The span tag does not create a line break similar to a div tag, but rather allows the user to separate things from other elements around them on a page within the same line. avoiding of line break, results only that selected text to change, keeping all the other elements around them same.